Fox Television, which produces “Empire,” says it is “gratified” that all charges against actor Jussie Smollett have been dropped. Smollett’s character was removed from the final two episodes of this season in the wake of his arrest in February on charges that he staged a racist, anti-gay attack on himself. The two candidates seeking to succeed Chicago Mayor Rahm Emanuel are asking for a more detailed explanation for the dropping of charges against “Empire” actor Jussie Smollett. Former federal prosecutor Lori Lightfoot says the public has to be told what the underlying basis was for the Cook County State’s Attorney Office’s decision Tuesday. Many legal experts are stunned by prosecutors’ decision to drop charges against “Empire” actor Jussie Smollett. Cook County First Assistant State’s Attorney Joseph Magats told reporters that he still believes Smollett filed a false police report. Legal experts say it’s particularly unusual that prosecutors didn’t demand an apology or otherwise insist Smollett take responsibility. Prosecutors say one of the reasons they decided to drop charges against actor Jussie Smollett was because they want to focus resources on the city’s gun violence. Prosecutors says a stunning decision to drop charges against Jussie Smollett doesn’t mean they no longer believe he staged a racial and homophobic attack against him in January. The family of Jussie Smollett says they feel grateful after charges were dropped against the “Empire” actor. His family said in a statement Tuesday that Smollett’s character was “unjustly smeared” and the “truth prevailed” shortly after prosecutors dropped felony charges against him during a Chicago court hearing. The actor had been charged with falsely telling police he was attacked in the downtown area in January. The family called Smollett the victim and hope the “real perpetrators” are brought to justice. Chicago’s police union is outraged but not surprised that prosecutors dropped charges against “Empire” actor Jussie Smollett. Fraternal Order of Police spokesman Martin Preib said Cook County State’s Attorney Kim Foxx is “not respected with police officers.” He says the union previously asked the U.S. attorney’s office in Chicago to look into the Smollett case. The charges were dropped Tuesday. Foxx’s office hasn’t responded to multiple requests for details. She had recused herself in February from the case. 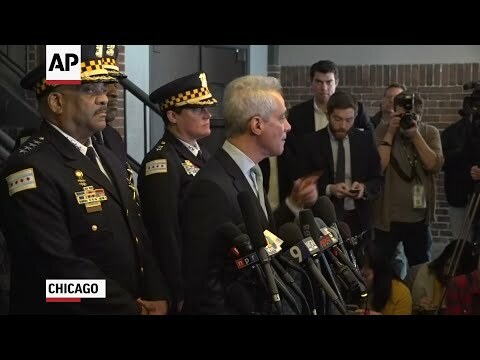 Chicago Mayor Rahm Emanuel and the city’s police chief have angrily criticized Jussie Smollett and the decision by prosecutors to drop all charges that alleged the “Empire” actor staged a racial and homophobic attack in the city in January. Prosecutors haven’t explained why they made the surprise decision and haven’t said if they still maintain Smollett orchestrated the incident. The “Empire” actor spoke to reporters Tuesday after a court hearing in which his attorneys say prosecutors dropped all 16 felony counts alleging Smollett staged the attack. Prosecutors haven’t explained why they made the surprise decision and haven’t said if they still maintain Smollett orchestrated the incident. “Empire” actor Jussie Smollett says he wants to get back to work and get on with his life. Prosecutors say they believe they’ve reached an “appropriate resolution” in the case against “Empire” actor Jussie Smollett. In a statement, prosecutor’s office spokeswoman Tandra Simonton offered no detailed explanation. Attorneys for “Empire” actor Jussie Smollett say charges alleging he lied to police about attack have been dropped.